SHF #35: The Beautiful Fig | What Smells So Good? 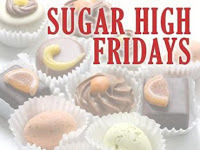 Well, I saw yesterday over at the wonderful (and wonderfully kind) Canadian Ivonne's site that the new SHF theme was figs! Not only that, but she has just come off a previous hosting gig of La Festa Al Fresco, with half of a beautiful round-up to boot! You go, girl, and I hope you enjoy all that the blogging world has unleashed on you! Of course, I cannot continue without due mention of the founder of this sweet event, Jennifer of theDomesticGoddess. Her blog is so divine to read and I'm happy to be able to take part in her event! This theme works well for me, as I am part of a family of fig lovers (noshing in both fresh and dried forms). Unfortunately, I don't often cook with them, since they aren't usually a pantry or fridge staple for us (unless of course the future SF goes to Costco... then we wind up with 40lbs of them (fresh), 20 rock-hard peaches and 5 huge jars of nuts). I can't bash the store too much though, since they have the camera I'm craving to get my hands on and it may be coming for Christmas... hey, a girl can dream, right? In Chinese the fig is called 'fruit without flower'. The flowers are pollinated by very small wasps that crawl through the opening in search of a suitable place to reproduce (lay eggs). In turn, the flowers provide a safe haven and nourishment for the next generation of wasps. Figs are rich in calcium, potassium, phosphorus, and iron. 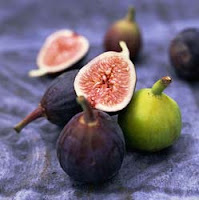 Figs are the sweetest of all fruits, with a 55% sugar content. One serving of figs is 40 grams, about 1/4 cup, or about 3 Calimyrna figs or about 4 to 5 Mission figs. Figs are high in fiber, providing 20% of the Daily Value — more dietary fiber per serving than any other common dried or fresh fruit. If you're looking for more info, check out The Fig Lady! So here's the recipe. Italian inspired polenta, with banana for moisture and sweetness, plus raisins in addition with the decadent figs, makes this cake a great change to any dessert table. You can add nuts if you like, hazelnuts or even pine nuts would be good choices. Preheat oven to 375. Grease an 8" square pan. Beat egg replacer, banana and sugar in a large bowl. In a saucepan, bring soy milk, brandy, and salt to a brisk simmer, remove from heat. Gradually add soymilk to banana mixture. Return everything to the saucepan, add corn meal and whisk until thickened and beginning to bubble. 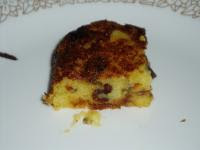 Add figs and raisins to the batter and pour into the cake pan. Cool 20 minutes in the pan, then invert onto a plate. Wow, Sarah! That is a beautiful cake. And I love all the facts that you mentioned about figs. Thanks so much for taking part in SHF #35!